The reunification of Germany and the government’s return to Berlin were sealed during Chancellor Helmut Kohl’s term. Axel Schultes and Charlotte Frank, two Berlin architects, were commissioned to design a new chancellery at the Spree riverbank. Once it was all approved, the construction began in 1997. By the time the building was ready in May of 2001, Gerhard Schröder was chancellor. When he moved in, he thought his new office was a bit too big. He was not the only one who thought so. The reunification needed to be paid for. Reconstruction in the new provinces located in former Eastern Germany was not cheap. For that reason, the Chancellery’s price tag of 513 million Marks (262.3 million Euro, 299.3 million U.S. Dollars or 232.8 million pounds) seemed quite high, to say the least. But the building had already been erected. So Schröder moved in. He now had the largest government HQ on the entire planet, eight times the size of the White House in Washington D.C..
On the ground floor, the building has a big conference room with cabins for interpreters as well as sort of a theater which accommodates 200 people. The second and third floors are reserved for the service personnel as they contain a huge kitchen and the tech rooms necessary to run things in the building, from elevators to communication systems. The fourth floor offers a bugproof conference room and an archive. Another floor up, the big banquet hall is located, along with some offices. The 6th floor contains two cabinet halls. Those are in use quite often. On the 7th floor, the Chancellor has a nice view of Brandenburg Gate from his or her office. The head of government’s apartment is on the 8th floor. Threehundred offices for the chancellor’s staff are located in the building’s side wings. Guess what: All of this is not enough anymore. The building is bursting. Angela Merkel’s staff does not fit. The number of her staffers has nearly doubled in the past years. Also there is one amenity the old building does not have: a helipad. Merkel’s Chancellery Minister Helge Braun announced the construction of a second building on Tuesday. It will be located across the Spree river, right on the other side, and connected to the existing main building by a bridge. Once the second Chancellery building is completed in 2028, staffers will not have to use conference rooms as offices anymore. People won’t be stepping on each other’s feet. They have nine years to think about the color of their walls and carpeting. The new building will have six floors, 400 offices, a kindergarten, a canteen, loads of conference rooms and a helipad at the top. These days, Mrs. Merkel’s helicopters land in the park next door. Her security team does not like that aspect at all. Axel Schultes and Charlotte Frank, the architects who built the ‘washing machine’, which is how heretics call the existing Chancellery, have also designed the second building. Its price tag: 460 million Euro (524.7 million U.S. Dollars or 408 million pounds). At least. 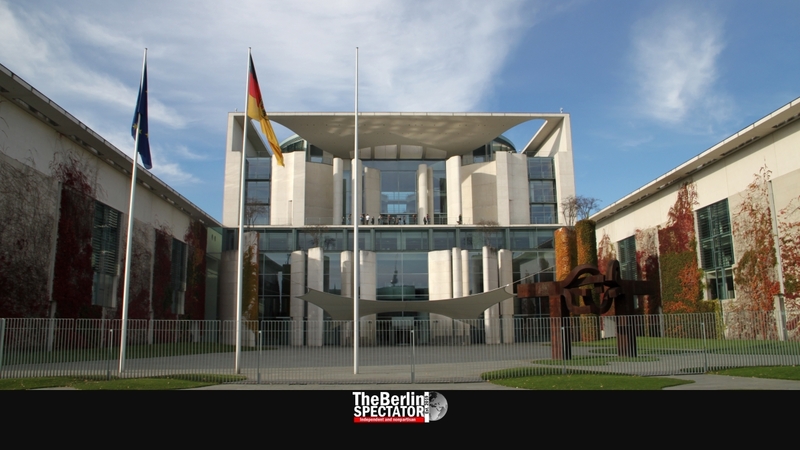 The second Chancellery will also fill a cavity in the government district. At this stage, the “monster central station” made the Chancellery look “filigree”, architect Schultes told reporters today.